For your holiday here in the Dordogne, we invite you to stay in our stylish, modern apartment in a delightful woodland setting, well suited for two people. With so much to see and do locally La Petite Borie is a wonderful escape to the countryside where you can enjoy the privacy of this quiet location with its relaxing, tranquil atmosphere. Our guests have said 'its like being in the middle of nowhere, yet right in the middle of everything the Dordogne has to offer'. La Petite Borie is situated in the charming little hamlet of La Jaubertie, 2 kilometres from the artist village of Meyrals, with its quaint artist studios and its annual scarecrow festival. Here you have a choice of two restaurants, an Auberge and our local bar/restaurant, a Boulangerie for your daily bread and croissants along with a post office. Approached via your own private drive, you arrive at the apartment and its secluded terrace. The extensive outside space has comfortable patio furniture and two sun loungers should you wish to relax in the shade of the oak trees. You have your own garden area and barbecue for al fresco dining, a truly romantic place. The old stone shepherds shelter in the garden is an historical feature in this part of France known as a ‘Borie’ from which the apartment takes its name. From the terrace you enter the apartment through double doors leading into the spacious main living space - an L shaped open-plan living/dining/kitchen area arranged on a single level. The apartment is comfortably furnished with all the facilities you will require to enjoy your stay. These include a Laura Ashley sofa-bed, coffee table, dining table and chairs. Smart TV, providing all UK Freesat channels, Netflix, radio and music channels. In addition there is a Blue Ray DVD player and JCB speaker that you can plug in your smart phone. The modern kitchen provides cooking facilities, including oven, induction hob, fridge and dishwasher. Toaster, coffee maker, kettle and ample chinaware and cutlery. There is also a washing machine. Leading off the main living space is the bedroom. Furnished with a King sized bed and two chest of drawers. This is a delightful room with a view through the woodland where the early sun penetrates through your window. The shower room is equipped with walk in rain shower, WC, washbasin and heated towel rail. Whilst La Petite Borie does form part of the owner’s main house, we have ensured your total privacy into and around the apartment. The south facing 10m x 5m swimming pool including a large terrace area is close to the apartment and is shared with the owners. This is fully equipped with sun loungers and parasols for sunbathing during the hot summer months. The pool is unheated and open for the months of June through to September, possibly October should we have continued warmth and sunshine. Our rental prices include towels (excluding pool towels) and linen. The property is cleaned at change over and linen/towels renewed. Known as the Dordogne’s ‘Golden Triangle’, offering a huge choice of tourist attractions, from castles, pre-historic caves, beautiful ancient villages, canoeing and countryside walks. Sample the ‘Perigourdin’ cuisine; you will be spoilt for choice with so many restaurants to choose from. Close by is Sarlat La Caneda known for its beautiful ‘medieval old town’. Fill your senses with all Sarlat has to offer, stunning architecture, wonderful restaurants, bistros’, cafes, bars and elegant shopping. On the outskirts of the town you will find all the large supermarkets along with other retail shops. St. Cyprien is a 10 minute drive, with two local supermarkets and pharmacies, boulangeries, cafe’s and local shops. The Sunday morning market is not to be missed, full of local farmers/producers offering culinary highlights of the region. About Mary & Adrian Robinson We took a 2 month road trip of Spain and Portugal expecting to find our new home. However this was not to be and on our way home to the UK we took a few days holiday in the Dordogne. The area with its beautiful greenery and rolling hills was such a joy to both of us. It reminded us of the Cotswold's most idyllic English Countryside. The advantage was the extended summer and so we decided France was the location for our next adventure in life. 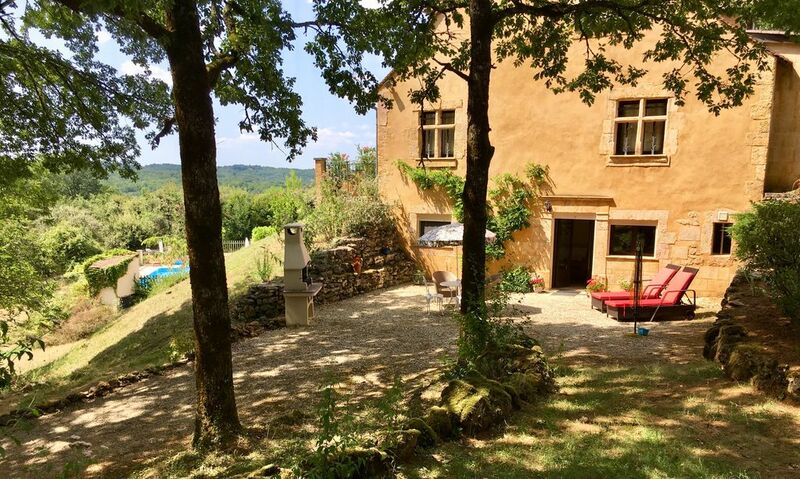 It took three years of searching the Dordogne to find the perfect location until we found Les Chenes in La Jaubertie where we have lived since 2016. “We feel we have the best of the Dordogne” says Mary. Enjoying all the attractions within such a short distance. We really enjoy the local markets, our favourite is right on our doorstep at St. Cyprien on a Sunday morning. In the summer season there are some amazing fetes on in all the surrounding villages and night markets where you can eat and dance until the early hours. It is so lovely to have the choice of so many places to see and visit close-by and then we relish returning home to the peace and tranquility of Les Chenes with its amazing sunsets. Sitting on the terrace with a nice glass of bubbly watching the sun go down and listening to the birds is sheer bliss. The recently renovated apartment forms part of our home ‘Les Chenes’ and we have worked hard to create a modern comfortable space that is private and secluded. La Petite Borie has completely private access benefiting from its own drive, parking and a garden in the woods leading into the forest, much of which is on our land. We want our guests to enjoy the beauty of this idyllic spot as much as we do and so far the feedback and reviews confirm our guests love it. Notes on accommodation: We look forward to welcoming you and are on site should you wish further information about the area. We do not accept pets in the apartment, which is also a non smoking area. Ryanair from East Midlands, Stansted, Liverpool & Bristol airports. Flybe from: Birmingham, Exeter, Southampton, and Edinburgh.